If you aren’t up to speed with how I nickname things by now then I guess starting this post with the different names I give things is a good idea. In the magical fairy tale that is my life (I am sane, please don’t worry about my mental state already), I am ShaunyCat (a nickname kindly given to me by my friend Emis) and I live in Shaunyland. 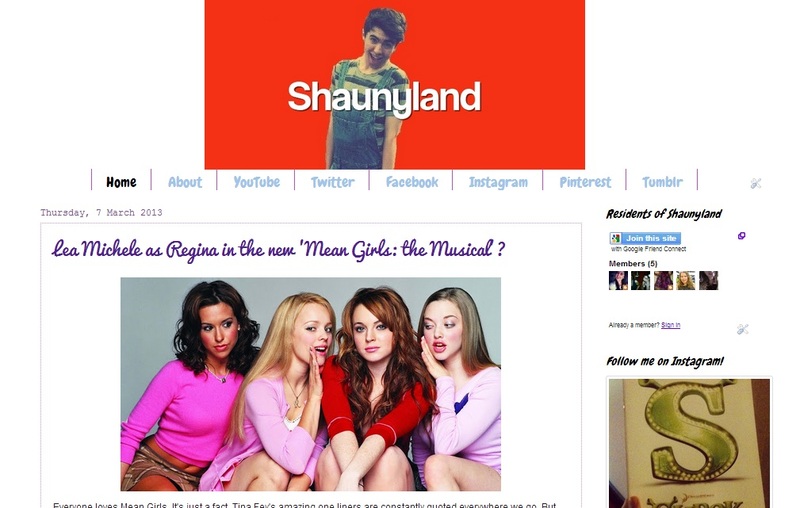 All my social networks are in Shaunyworld (keeping up with this so far?) Now as I’ve already said, Shaunyworld is magical so everything in Shaunyworld ends with magic. For example, my Pinterest boards are ‘Wordy Magic’ and ‘Crafty Magic’. Got it now? Apologies about this being such a poor blog post but regardless, I thought I’d share this information with you nonetheless. < Lea Michele as Regina in the new ‘Mean Girls: the Musical’? I like! Much less cluttered!